On Pinterest, the image is the beginning, middle and end of the story, so the quality of images in your Pinterest stream is likely better than anywhere on the Internet. 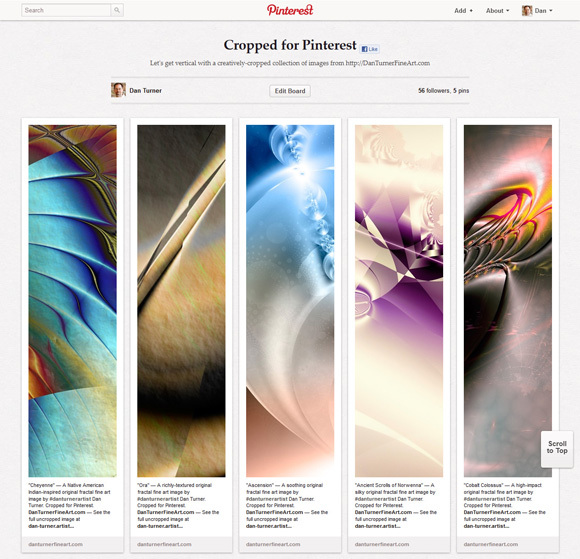 But there is a problem with this visual feast: The Pinterest interface is best-suited to accommodate vertical images. Those of us whose work is primarily horizontal are running into “tiny image syndrome”. The solution? Crop your images. Use a large, attractive vertical slice to compete for a share of the screen, then link that slice to your full-size horizontal image. Pinterest artists are just starting to catch on to “mega-cropping”, but I predict we’ll soon see an explosion of vertical slices. Since Pinterest doesn’t allow redirects or tiny urls, clicking on the slice sets up a three-click sequence to access the uncropped image. However, you can include a one-click, direct link in the caption below the image. Now you’re cooking! This is great. Without an upload, how does one go about doing a vertical crop on URLs pinned from the internet? I’ve noticed a lot of pins from flickr nice and large, but when I pin them, it becomes horizontal and small. Hi Sanuly; I’m not aware of any “on the fly” cropping utilities. You have to crop the image before uploading to Pinterest. Brilliant idea, Dan! I’m taking your great advice . . . slicing away at this very moment.